Want to know a simple trick to elevate your humble hunk of steak to stellar heights? Fish sauce, along with fresh garlic and ginger, is an easy way to add an umami depth of flavour to your next steak dish – whether a straightforward meal of steak and veggies or perhaps a beef salad. Once you try a simple marinade like this, you may never go back to plain, undressed steak again. Some other marinades I’m keen to try soon are the coffee marinade from The Food Lovers Primal Palate and similarly, their chimichurri marinade. Fun times. Marinade for 3-6 hours in the fridge before cooking. Ensure meat is brought to room temperature before cooking. For an even better taste, consider using a cast iron grill or the great Aussie barbie. Who remembers rock cakes from their childhood? Anyone, anyone? My nana used to make them every time we went up to visit her on the Central Coast of NSW every month or so. They’re a little like scones, but with the texture and look of rough rocks. Only thing is, they don’t make for good pets unlike other rocks. I used to love them as a kid, but now I think back to it, the wheat flour used to leave a nasty aftertaste in my mouth which I’m not too keen on repeating these days, especially since I know wheat flour isn’t a requirement for straightforward and delicious baking adventures. I used an Elana Amsterdam recipe, tweaking it a little and trying to get the shapes as rock-like as possible…I failed a little in that they weren’t jagged enough – they turned out more like rocks smoothed by the action water. I even made a special batch just for my Dad with some icky fake cherries in them just to cater to his desire to return to the era when his Mum would make these treats for him. 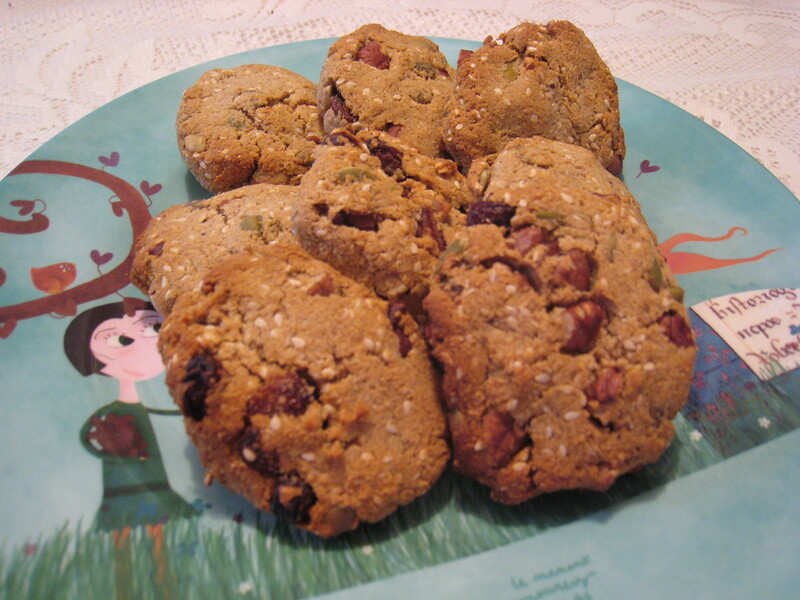 These make for a great treat to take out for a picnic or just for a snack on the go. You can also adapt them and include any ingredients you wish. Of course, that is if you can resist eating all them as soon as they come out of the oven! This is a colourful and flavourful salad right in time for the warmer days ahead and, like everything else I tend to make, easy! Plenty of antioxidants, healthy fats and flavour are to be had with this salad which tastes super fresh. 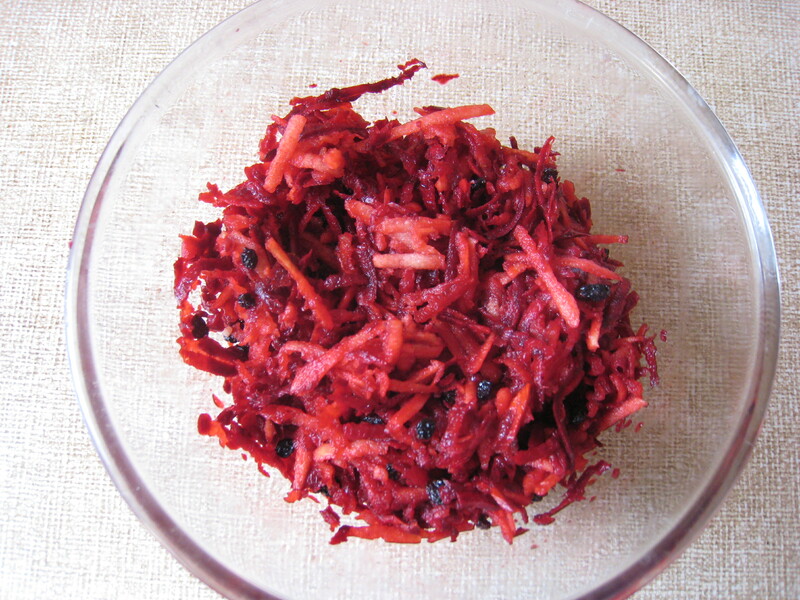 Just be careful of getting beetroot stains all over you when making it – though, for the ladies, beetroot makes for a great blush. In these trying financial times, where bananas are priced like gold bars, the humble sweet potato is a more than worthy replacement in baking recipes that call for some of that sweet yellow mush. Of course, in many Asian countries, sweet potato is a common ingredient in desserts, less so in the West. Of course., Americans are in sway to their iconic pumpkin pie, so it’s no great leap to think of a sweet potato in dessert or cake terms. When I saw this recipe for sweet potato hazelnut cake on Chris Kresser’s wonderful site, I just knew I wanted to make it the next thing on my baking list especially considering the great banana crisis of 2011 had left a bit of a hole in my cooking repertoire. One of the commenters on Kresser’s post had also branched out to make the cake with spices, in the tradition of Scandinavian spice biscuits, which I love but are full of sugar and other nasties in commercial preparations. 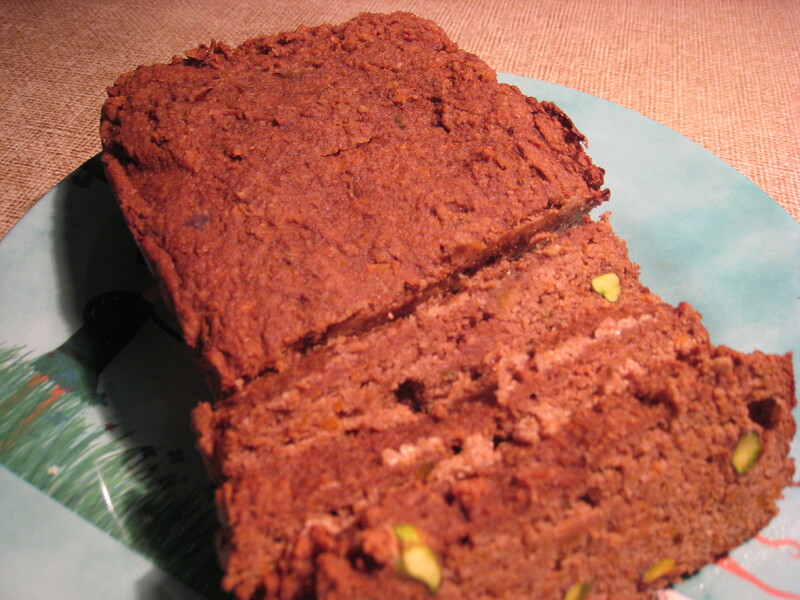 The first time I made this cake, I used hazelnut meal and included the spices – unfortunately, the spice flavouring overpowered the hazelnut flavour, so now I leave out the spices but will return to them later to make biscuits. My more recent attempts at this cake (or loaf as I have made it) were using almond meal which is cheaper than hazelnut meal and is a real staple in my pantry. It has turned out perfectly each time – the sweet potato has a beautiful richness to it, especially since it is baked whole with the skin on before preparing the cake mix. Just like with banana, the sweetness means you can get away with much less sweetener than in traditional cakes. Pre-heat the oven to 175C or 160C for a fan forced oven. When the oven is ready, put the sweet potatoes on a baking tray and put them in the oven where they should remain until the sweet potatoes are quite soft when tested with a fork – you’ll probably notice some syrup comes out of them – no need for alarm! They usually take about an hour. Turn the oven off until the loaf/cake mix is ready. Let the sweet potatoes cool on a wire rack or overnight and peel the skin off. Pre-heat the oven to 175C or 160C fan forced oven. When the skin has been peeled off completely and any hard parts of flesh have been discarded, mash the sweet potato thoroughly to ensure it is as smooth as possible. If you prefer, you can place all the ingredients in the food processor. If not, mix the dry ingredients together and also the wet ingredients (in separate bowls). Then, combine the two bowls of ingredients, mixing thoroughly. Pour into a 9×5 inch loaf tin lined with baking paper, making sure to evenly distribute the mix and smooth the top. Place in the oven, baking for 40-45 minutes, or until a knife entered in the centre comes out clean. When ready, remove from the oven and cool in the tin. This loaf can be sliced with a sharp bread knife and either stored in the fridge or frozen – it’s best to slice and then freeze each slice flat on a tray otherwise the slices may freeze together and be annoying to separate. 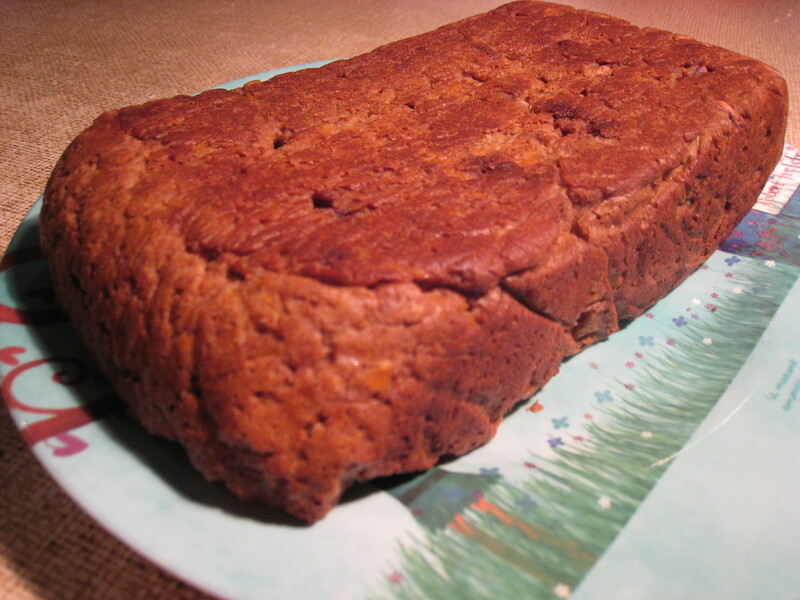 The loaf toasts really well, making for a great raisin toast replacement. Spend a little more on quality mince beef and you can be rewarded with a meal unlike anything you’ve tried before with the housewive’s staple. If you can source some free range or organic mince beef that has been aged, it’s well worth the effort. 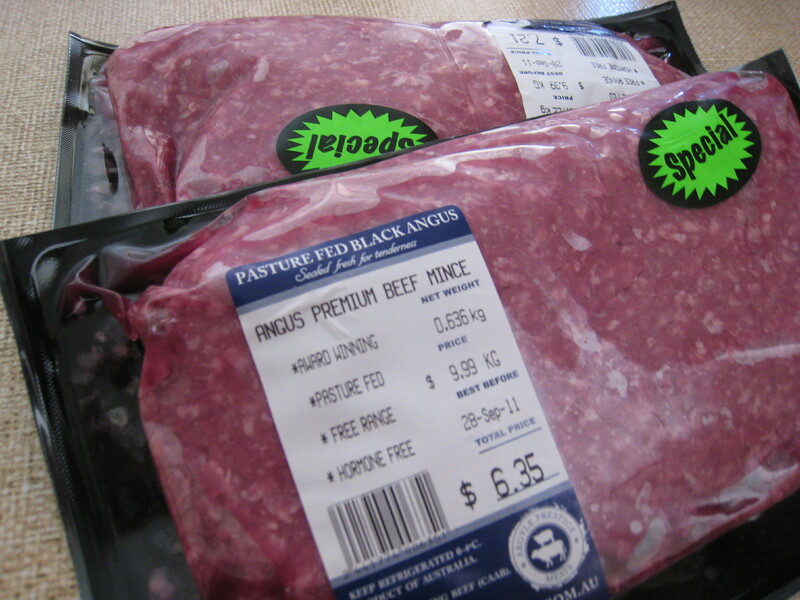 The meat that I used was pasture fed Black Angus from Argyle Prestige Meats which I bought at Harris Farm Markets. This dish is another of those lazy-but-oh-so awesome Paleo-friendly dishes that I love to make and then savour. 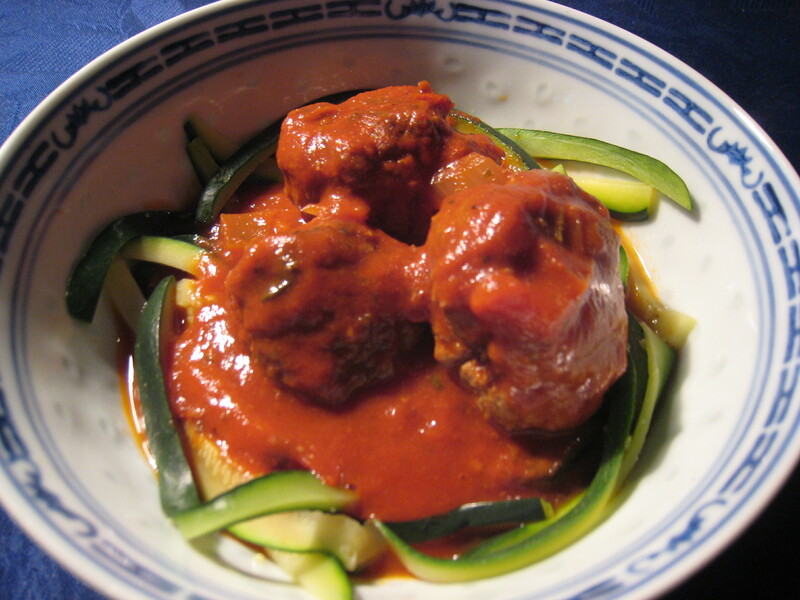 Meatballs put the ‘comfort’ back in comfort food, but the beauty of this dish is that the zucchini “pasta” is a great stand in for the grain variety. I’m not going to post a recipe for the meatballs as everyone seems to have their favourite recipe for meatballs already, but I wanted to post this all the same as an idea of a great dish that can come from sourcing the best ingredients you can and applying those to a favourite recipe with impressive results. This may all sound like hyperbole, but when you really get in to Paleo cooking, your tastebuds search out good quality ingredients instead of addictive, but empty and damaging, hits of wheat and sugar. Here are the details for making the zucchini “pasta”: make the pasta threads themselves by slicing the zucchini into julienne strips, then dunk in boiling water for 2 minutes only and then drain. Use 1 zucchini per person that you are serving. Dukkah is undoubtedly one of my favourite discoveries, food-related that is, of the last few years. I really think one of the keys to success to implementing a healthy diet is the vast array of amazing and delicious spices out there – there is infinite variety and creativity in the spice world (no, not *that* Spice World). Dukkah is a ground nut and spice combination with a few varieties available. It can be bought at either a spice store, specialist grocery store or even in the big supermarkets – the brand I like is Table of Plenty which is available at Coles. 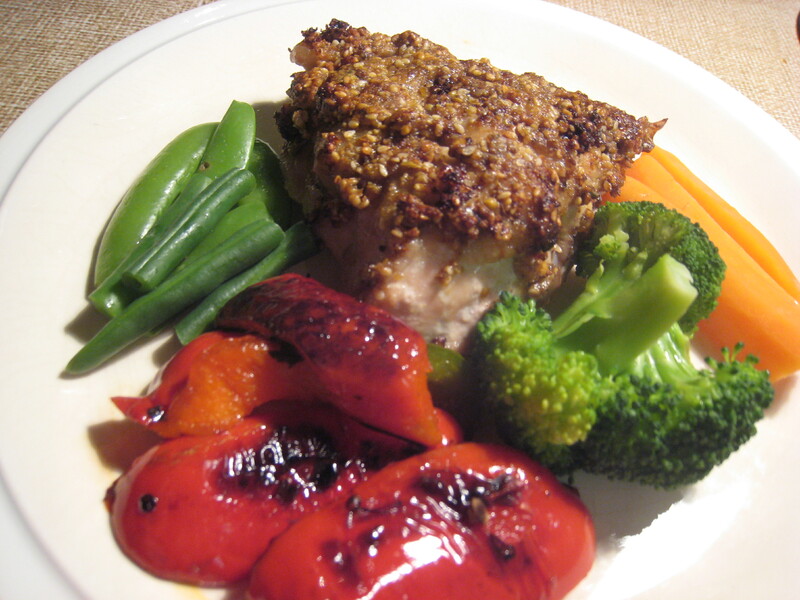 At home, chicken and fish seem to be the most complimentary options when cooking with Dukkah. This recipe is for Dukkah oven-roasted chicken and it’s super easy to prepare, taking only 10 minutes before it goes in the oven. 3 or 4 half (or 2 full) chicken breasts with bone in. Skin either on or off. Preheat oven to 180 deg celsius or 160 deg celsius for fan forced oven. 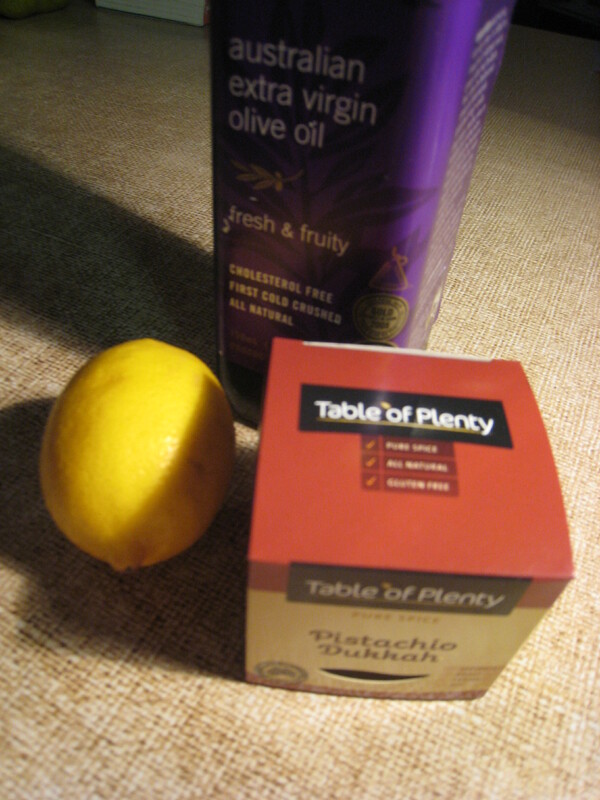 Combine the dukkah, oil and lemon juice in a small bowl then coat the chicken breasts with the mix. Breasts take between 30 and 50 minutes, depending on the size of the breasts. To check they’re ready, stick a fork in the chicken – if the juice runs clear (not pink) then they are done. Serve with roasted and steamed veggies and baba ganoush. Listen up, hommus lovers. There’s a far better dip out there – creamier, tastier and simply a garlic explosion. It’s called baba ganoush. When made to the traditional recipe, it’s also Paleo-friendly, since it doesn’t contain chickpeas which hommus does. My tip is to avoid the packaged baba ganoush as most of them contain unnecessary fillers like vegetable oil – either make it yourself or pick up a tub of the good stuff from a Middle Eastern restaurant or takeaway place. It goes really well with chargrilled meats and is a great condiment to have around to jazz up casual meals, especially lunch which I usually have trouble finding inspiration for. It would also make the perfect accompaniment for homemade veggie chips, which have been languishing on my to-do list a little too long. 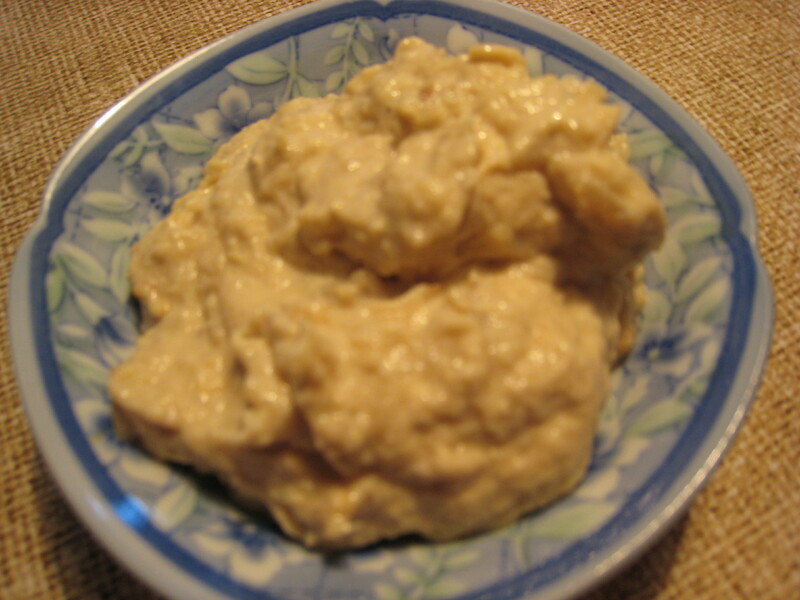 The ingredients of traditionally made baba ganoush are: eggplant, tahini (sesame paste), garlic and lemon juice. Nothing beats simple right! Here’s a Lifestyle Food recipe for baba ganoush if you fancy trying it – it does taste much better if you can BBQ the eggplant or chargrill it on a gas hob. I don’t have a gas stovetop, so I get my baba ganoush from Grandpa’s which is a Lebanese takeaway place in various parts of Sydney. For meat eaters, bacon is surely one of life’s simple, but great, pleasures. Cooked well, it’s manna from heaven. I hadn’t eaten bacon for quite a few years until I found some great free range bacon (Spring Hill brand) and noticed that a lot of Paleo bloggers actually bake it rather than fry it. You may not believe that bacon could be improved on, but you’d be happily proven wrong! This is a far superior way to prepare bacon, and you can collect the grease for smothering veggies with later! Trust me, you won’t go back to eating home-prepared bacon that’s fried. Preheat oven to 220 or 200 deg celsius for fan forced. 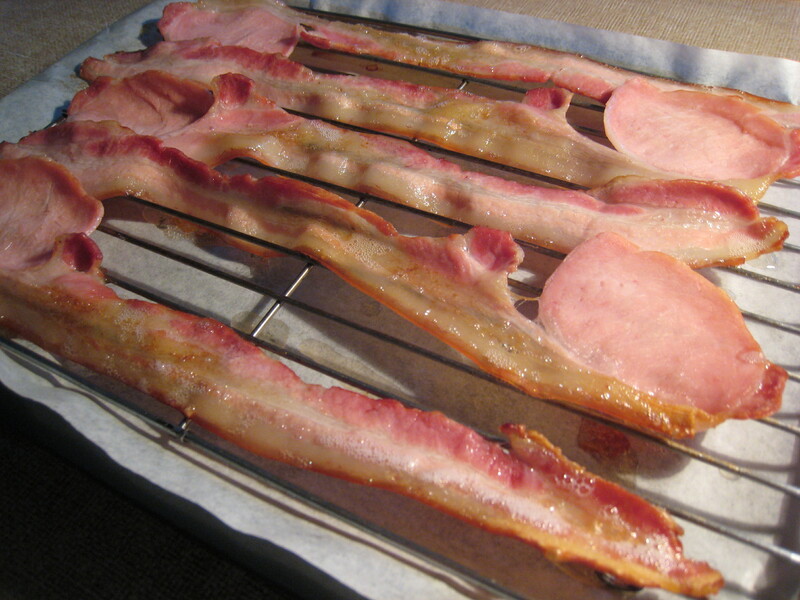 Prepare bacon by making sure it is as dry as possible, for example by blotting with paper towels. 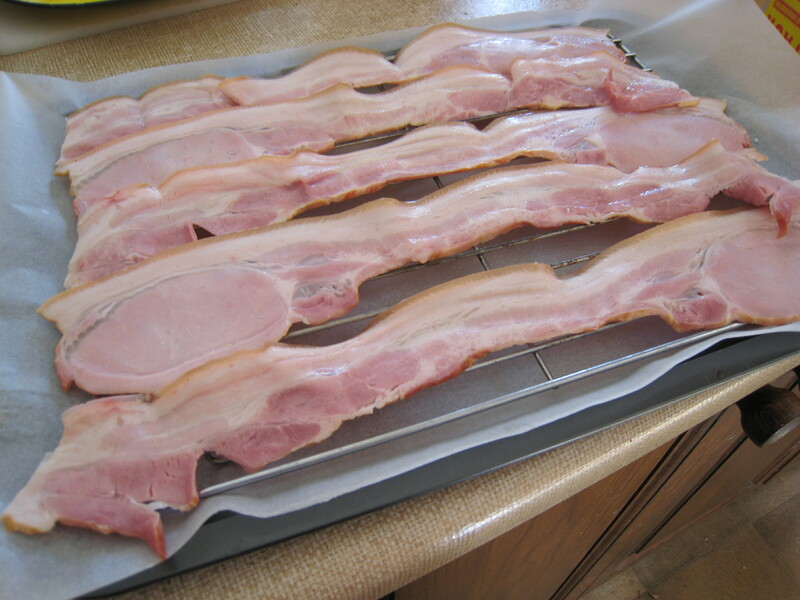 Line a shallow baking tray with parchment (baking) paper and then place the bacon rashers on a wire rack. This will allow the bacon to cook through and for the grease to drip on to the parchment paper. Once the oven has reached the right temperature, place the tray on the middle shelf and set a timer for 10 minutes. Check on bacon after 10 minutes – it’s ready when the flesh is a darker pink colour and has curled up a little. It usually takes between 10 and 15 minutes. Since the oven is so hot, be careful not to let it burn! Bacon, ready for nom nom's! Once it’s ready, remove from the oven and turn over each rasher to allow more grease to drain off the rashers and on to the paper. Serve bacon with breakfast, lunch or whenever the hell you feel like eating it. Do not discard the fatty bits – that’s where you get all your crucial fat-soluble vitamins and energy source from! I’ve had my eye on this Elana Amsterdam carrot cake recipe for quite a while now and Father’s Day was the perfect excuse to have a go at making it. 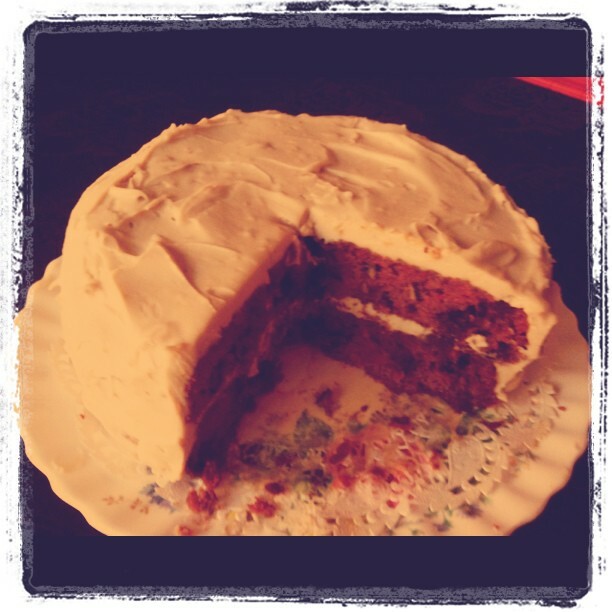 I wasn’t really convinced the usual cake frosting could be done in a Paleo-friendly way, but I was happily proven wrong! It was delicious, in fact the cake was way better than any you could buy in a cafe. Yes, that may sound a little like I’ve got tickets on myself, but it really was that good. Only, not good enough for my twin brother to eat, but let’s not go there 😉 At least that means there was more for me and my Dad, since it was his day after all! The only thing I need to sort out is how to avoid clumps in the icing which seemed to be the arrowroot powder clumping with the sweetener….I suspect it’s something to do with the temperature when the arrowroot paste gets mixed in with the rest of the icing mix. As usual with Elana Amsterdam recipes, I swapped grapeseed oil for coconut oil and instead of agave (aka, hippie’s high fructose corn syrup) I used rice syrup and some maple syrup. The sweetness was perfect – the cake was moreish without being sickeningly sweet. 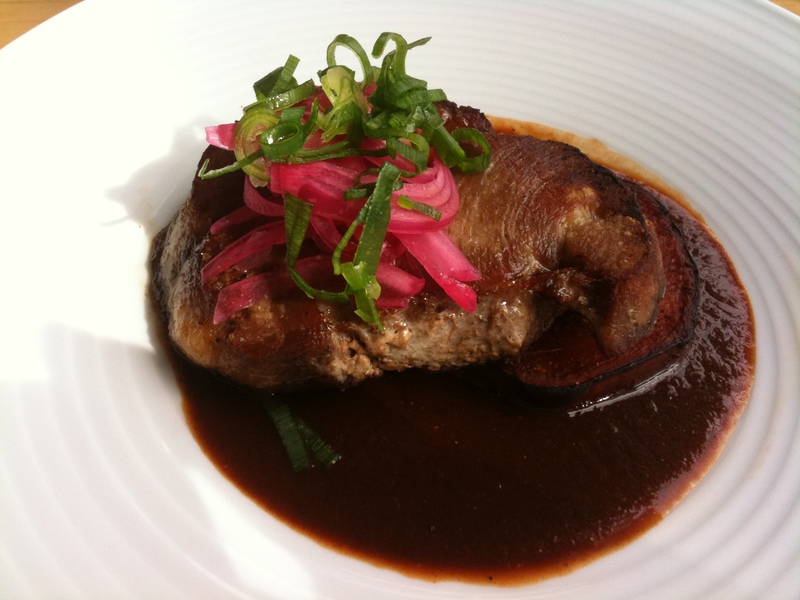 No doubt, eating out Paleo can sometimes induce a violent episode of hair pulling. So, I’m always delighted when I find gems in Sydney that make it easier, and downright delicious! I’ve been to el Capo three times in the last couple of months so I definitely like the joint. The first time I went, I was on my own and much to my bemusement, George and Matt from Masterchef came in for lunch and sat right opposite me. Quelle horreur! I’m self conscious at the best of times, and unfortunately I had nowhere else to look except right at them. Thanks to my trusty iPhone, I managed to avoid being slapped with a restraining order owing to excessive unintentional staring. Sydney is currently in the midst of a South and Central American cuisine obsession – see the runaway success of Porteño for starters, not to mention all the decent new Mexican places springing up all over the shop. 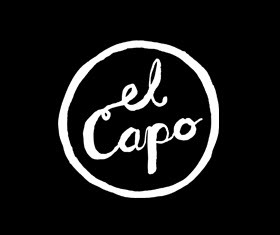 el Capo doesn’t disappoint – from the amazing murals on the wall to the cool, yet super friendly staff, and of course….the food. The dishes are all quite hearty – you probably won’t be leaving this place feeling peckish as most mains revolve around a key cut of meat or some quality fish. They’ve also got some great sides and snacks such as cabbage salad, which is deliciously fresh, and plaintain chips…those are on my list to try next time. 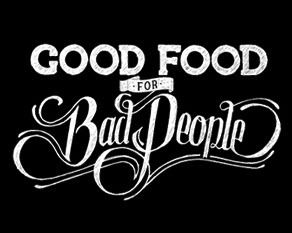 On this latest visit, I met up with Laura (@foodfoodandmore) to talk food, Paleo and UX. We both ordered the sweet pork neck from the new menu. It was definitely delicious, though the pork was a little dry. The sweet potato was cooked to perfection and balanced well with the guajillo sauce which had a mild spice and smokey flavour. A definite winner. I should point out that I have no idea whether there is gluten in the sauce – so if you’re intolerant or celiac, best to ask. For the flexible Paleo eaters and the non-Paleos, try the cornbread on the side….it’s incredible! Eggs Eggs Baby – not strictly Paleo but close! 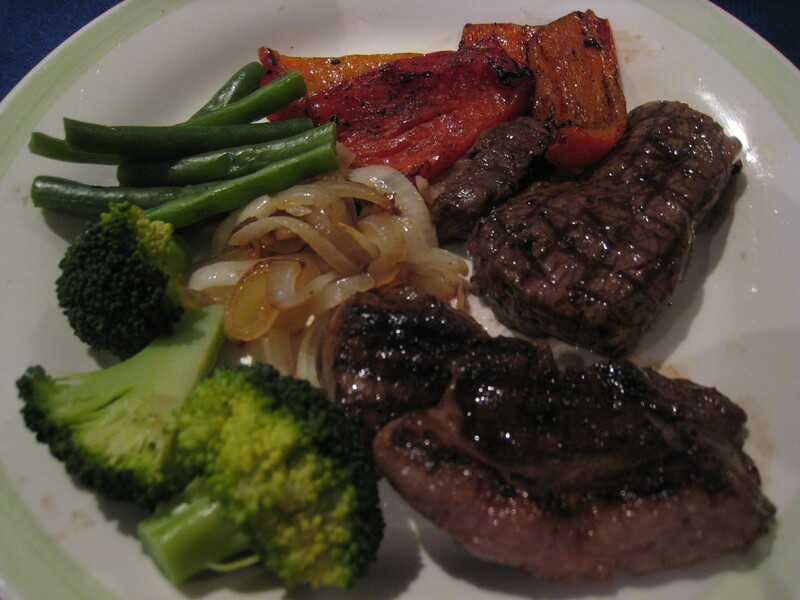 Paleo Food – lots and lots of recipes!